If you have adopted one of our cats or kittens, this is a copy of the leaflet which you were given in our adoption pack; it gives general advice to help you in the first few days and weeks. Thank you for giving a home to one of our rescued cats or kittens. Remember that it has been stressful for any cat or kitten to be in a rescue/homing centre and sometimes it has taken months to nurse a neglected cat back to health and happiness before they are well enough to be re-homed; it is important that you and your new cat, or kitten, get off to a good start. Keep your cat to a confined area with doors closed until they have settled in. Have a litter tray ready in a private corner before you let them out of the carrier. Keep their bed, water, and feeding bowl away from draughts so that they can begin to recognise: “This is my home and a safe place to be”. Close bedroom doors because a timid cat will initially want to hide under a bed, behind kitchen units, or some other dark, secretive place. Be aware of windows and please keep them secured! Your cat needs to be kept indoors for at least four weeks, (kittens much longer). On arrival, let the kitten inspect their new home. Show them their litter tray, water, and bed, and stay with them, keeping their attention until they settle. DO NOT LEAVE THEM ON THEIR OWN. Offer your kitten a little food and generally keep an eye on them until they tire and go to sleep. Do not let anybody pull them around; your kitten has senses and emotions and is a living creature, not a toy! I always feel it is advisable to liken a kitten to having a young toddler and therefore the same safety precautions are needed; think about risks and the smallest gaps! Your kitten will be frightened and distressed after leaving its mum and siblings so lots of gentle cuddles and tender loving care are needed. Give your kitten a cuddly toy to snuggle up to at night and make sure they are warm. Play before bedtime will ensure a better night for the kitten. The Homing Volunteer will have provided you with a small quantity of the food which your cat or kitten has been receiving (more information below). It is very important not to change a cat or kitten’s diet suddenly. If you choose another diet, it is important that this is mixed-in gradually. Any sudden change in diet can cause diarrhoea which puts your cat or kitten at risk of dehydration. Dehydration is extremely dangerous, especially in a small animal, and may require veterinary treatment. (Unlike dogs and humans,) cats are ‘obligate carnivores’ and require a diet based on meat protein. Twice a day, (or continuously,) we recommend that your adult cat is fed on a complete, balanced-nutrition, dry feed; we use ‘Burgess’ in the charity but also recommend good quality products like Hills, Royal Canin, Iams, etc. These are NOT biscuit ‘treats’ – which we do not recommend. We do not recommend pouches or tinned wet food because it sticks to your cat’s teeth and can eventually cause dental problems. If you choose to give small pieces of cooked meat or fish please check for bones. We do not advise you to give processed meat, or meat containing salt or onions. NB: ALL cats and kittens need fresh water to be constantly available. Up until 6 months of age, your kitten needs a complete, balanced-nutrition, dry feed, formulated for KITTENS. Your kitten can be fed continuously, or four times per day. As your kitten grows, their appetite will increase so, if they cry, asking for more, give more. Kittens will not over feed themselves – they will go back to their food as required but, if you should choose to feed wet or fresh food, do not leave it down for long, especially in a warm room, due to spoilage. Just like us, cats and kittens like their ‘toilet’, or litter tray, to be out of the way of people, intrusions, and noise; somewhere with a degree of ‘privacy’! But while, at first, their food and water needs to be close-by, please site litter trays carefully to avoid their contamination. Although there are other litter choices around, in the charity we use clumping, (fuller’s earth) litter. We choose this because it is preferable to remove both urine and faeces – as well as the litter they have contaminated, and to keep the litter tray as clean as possible. Litter needs to be regularly replaced and the tray and scoop sterilised. Boiling water is perhaps the least-toxic way to clean a litter tray and scoop. Please ensure that any disinfectant products used are allowed to dry thoroughly otherwise they may pose a risk to your cat. You must not let your cat outside for at least four weeks, kittens much longer. Your cat needs to have worked-out their home territory, by scent and by creating a mental map influenced by the sun and stars. This must be ‘imprinted’ or your cat will simply become lost again. However much he or she may ask to be let outside, the answer must be “NO”! This will encourage your cat not to venture too far at first. Importantly: do not carry your cat outside! Let them explore by themselves. If they do not, they will not be able to scent their territory (with their cheeks and paw pads) and make it familiar to themselves. The general rule is “nice and easy”; it will pay its dividends! Always keep your cat inside after dark; most cats are killed, injured, or stolen, during the hours of darkness! If you intend to board your cat at any registered cattery, an up to date vaccination certificate is legally required. Be aware that in the early days of your cat’s/kitten’s arrival home, they will be probably be stressed (as mentioned before in para 3). This may lead to minor symptoms such as sniffles, runny eyes, or diarrhoea which, providing your cat is otherwise active and healthy, may be of no consequence in the short term. BUT, if symptoms persist over more than 2 or 3 days or your cat/kitten stops eating and becomes lethargic, then you must seek expert advice. If you have adopted your cat or kitten from us, at Caring For Cats, please FIRST contact Coordinator Rose, or Steve, on the telephone numbers you have been given, for advice about the course of action to take. It is our policy to make certain that all cats and kittens that come into our care are neutered, either whilst with us or, in the case of kittens, at the appropriate age which is 4½ to 5½ months old. At Caring For Cats, the cost of neutering your kitten is included in the adoption donation made to us but it is the responsibility of the adopter to take their kitten to one of our supporting vets for this. If our Vet’s bill reveals that a kitten has not been neutered, we maintain the right to reclaim the kitten, without refund to the adopter. Please be assured that neutering is the kindest thing for your cat or kitten and that mating poses a real risk of fatal disease transmission. Apart from the risk of disease, a cat can become pregnant as early as 4½ months old and produce a litter of kittens. An un-neutered adult cat, during their lifetime, can result in over 20,000 descendants! All kittens experience roundworm and, at Caring For Cats, we will have treated your new cat or kitten for fleas and intestinal worms – but this will be a life-long issue requiring regular treatments. These should now be discussed with your vet and continued as your vet directs, (obviously, at the new owner’s cost). The most effective flea and worm treatments are licensed – see our separate leaflets on effective flea and worm control. If you intend to put a collar on your cat please ensure that it has a quick-release ‘safety buckle’ and (to avoid injury) will release immediately if it becomes caught on something, or twisted on the cat. A small tag needs to carry your phone number/address or possibly that of your vet. Please remember that all our cats and kittens are micro-chipped which means that any vet or animal charity can scan them to identify them. Local Councils collect up pets who are tragically killed on the road and some (including Hull, ERYC and York) will scan the bodies for micro-chips. REMEMBER: the micro-chip contact details, you gave us at the time of adoption, are logged and are the only means of contacting you. It is essential that you inform PetLog if you should move house or change your phone number – otherwise they simply cannot contact you if your pet were lost, and found. We hope that this information (leaflet) has helped you with the initial questions any new cat or kitten owner may have. 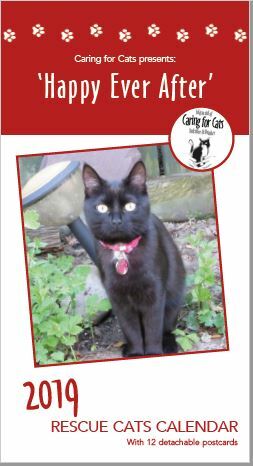 If you have adopted a cat or kitten from us, at Caring for Cats, you will have been given Rose Atkin/Steve Marshall’s personal telephone number (it’s printed on the homing agreement form). Please do not hesitate to phone them directly with any concerns or queries, regarding your new family member.